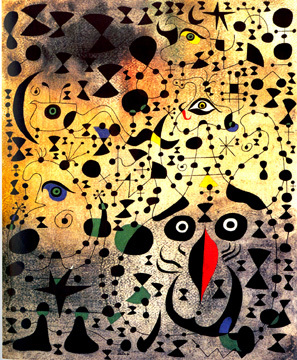 Two examples of Joan Miro’s work related to Automatism. Painted years apart the paintings show a shift in automatic drawing to more representational forms. The earlier work, as noted in my last post regarding the Automatistes, is closer to the idea of the unguided hand being let lose on the surface. Elements of automatism are at work in much of Miro’s practice. The Beautiful Bird Revealing the Unknown to a Pair of Lovers brings together automatic drawing with representational imagery and content. 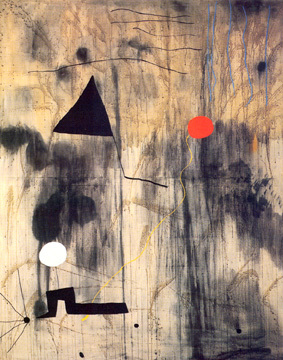 The work was done while Miro was in Spain while experiencing the terrors of the Spanish Civil War.